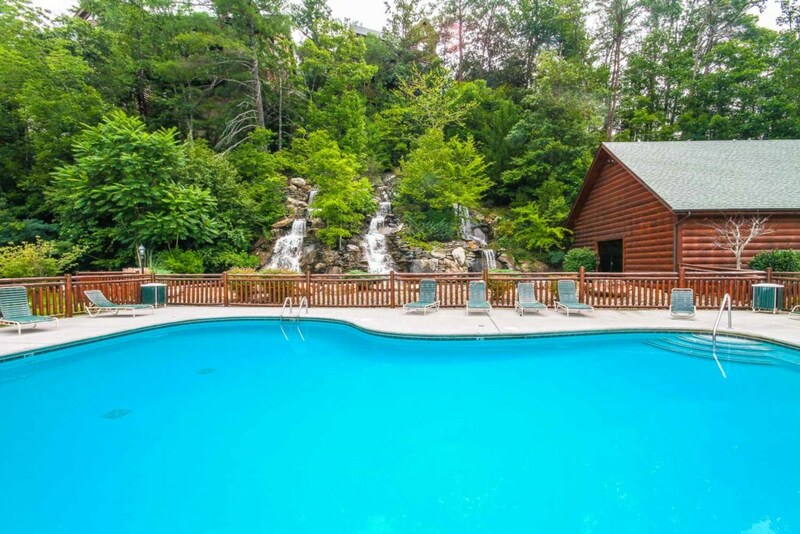 A luxurious 2,400-square-foot cabin rental settled within the Great Smoky Mountains, Southern Comfort Escape is great for a family getaway or a week in the mountains with friends. 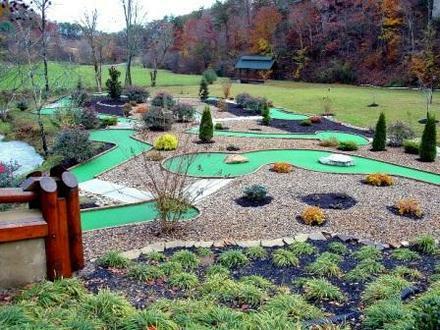 It's just about 5 miles from the exciting attractions and events of downtown Pigeon Forge, but it's still a peaceful escape from it all in the gated community of Bear Creek Crossing Resort. Relax in the rocking chairs with a glass of sweet tea and lush valley views, swim for hours on end at the community pools, play foosball and pool in the game loft, bake chocolate-chip cookies in the fully equipped kitchen, host movie nights on the big screen TV, and unwind with a spa bath in the master suite’s jetted tub! Not only will you feel relaxed and at ease at this log-style cabin, but you’ll also have the perfect space to create lasting memories with loved ones on your Smoky Mountain vacation. Living Room While there is plenty to do in town, you'll find more entertainment and relaxation at Southern Comfort Escape. Start with the living room, which was made for relaxing, with reclining sofas, an arm chair, and a 65in smart TV over the beautiful stacked-stone gas fireplace. Chat with friends by a warm fire, read the last book of your favorite novel series in comfort, watch feature films with pillow pallets for the kids on the large area rug, and soak in the lush wooded views streaming through the large windows all around. Kitchen Perfect for creating home-cooked meals, the fully equipped kitchen at Southern Comfort Escape provides all the necessities — with black appliances, cookware, dishes, silverware, mugs, and more! Fry eggs and bacon on the stove, reheat leftovers from the fridge in the microwave, rinse fresh ingredients in the stainless-steel double sink, brew endless pots of joe anytime, and let the dishwasher take care of the mess. Important note: don’t forget to stop on your way into town to pick up snacks and drinks to have at hand as you play and relax at the cabin or have your goodies delivered and unpackaged by our local delivery service. Dining Area A great space to spend quality time with family and friends, the updated dining room table offers a rustic yet modern dining vibe. There's room to seat up to 6 guests, and it's perfectly sized for a hearty meal. Pile sides in the center and easily grab seconds from the kitchen, mere steps away. After coffee and dessert, bust out the board games from home or take a little time to plan the next day’s outdoor adventure in town! Rec Room/ Loft A cozy space to unwind after a big meal, the open-air balcony in the loft harbors not only a media space with a flatscreen TV and a comfy seating area but also a gaming area with foosball, pool, and a table for 2. Enjoy shows and movies as you challenge one another to exciting multi table digital upright pinball, billiards battles or sit back and watch the games unfold at the pub-style table. There’s even a day bed with a trundle so the kids can play all night and go to sleep in the same space — something they will surely appreciate! Bedrooms Each bedroom of this cabin rental is furnished with a plush king-size bed, exposed beams, all-log interior, and decorative bedspreads to offer a cozy and welcoming feel. The TVs in every bedroom allow you to catch up on your favorite shows when you turn in for the evening. Take advantage of the jetted tub the master suite has to offer and enjoy a relaxing soak in the morning as you prepare for your day. Outdoor Spaces For some quality time in the great outdoors, head onto the spacious wraparound porch. Take a breath of fresh mountain air and enjoy a little slice of mountain paradise! Have your morning cup of coffee on the porch swing or relax as you put your feet up in the lounge chair with a cold drink on a warm summer day. On nice sunny afternoons, fire up the gas grill for a barbecue party at the outdoor dining table for 4. The rocking chairs in the evening will help you unwind along with the beautiful valley and wooded views you’re sure to love! 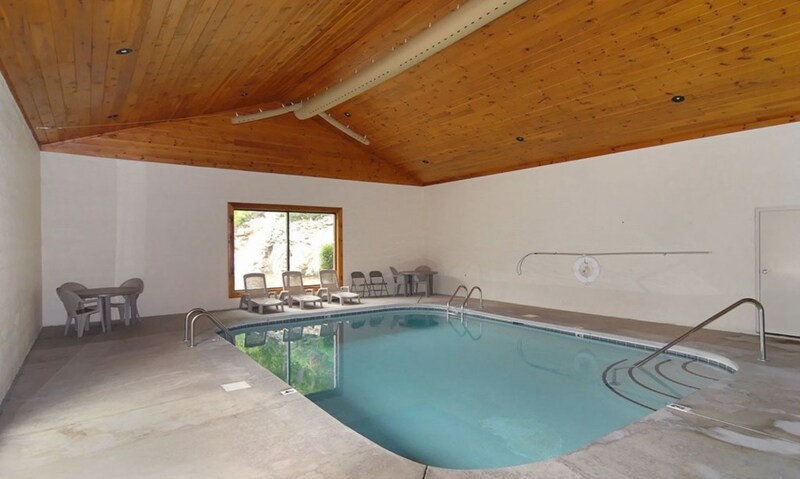 You can also de-stress in the hot tub as you soak all your worries away. Gaze at the night sky as the warm water covers for a cleansing and soothing time. And when you’re ready to hit the town, easily walk 1 step down to the paved, motorcycle-friendly parking area for 4, convenient for unloading and packing the cars as well as unleashing the hog! 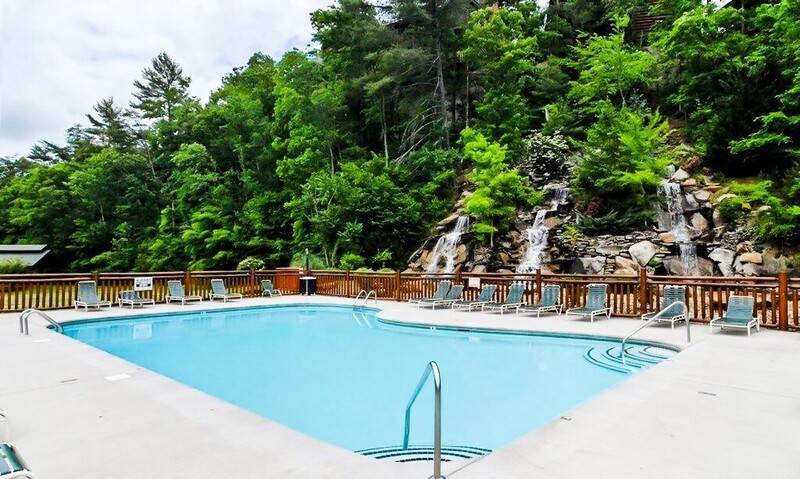 Other Amenities In addition to these wonderful amenities, Bear Creek Crossing Resort also offers a seasonal outdoor pool and a year-round heated indoor pool - a great way to spend an afternoon! Plus, the cabin boasts a few extras as well. Bring classic home videos to share with the family on the DVD, launder clothes and towels throughout your trip with the washer and dryer, and stay connected with friends via complimentary Wi-Fi! 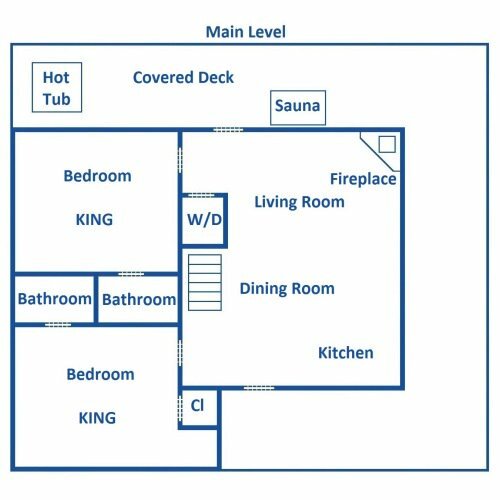 Sleeping Arrangements: Main Level - Bedroom 1: King Bed - Sleeps 2. Bedroom 2: King Bed - Sleeps 2. Main Level Living area: Queen Sleeper - Sleeps 2. 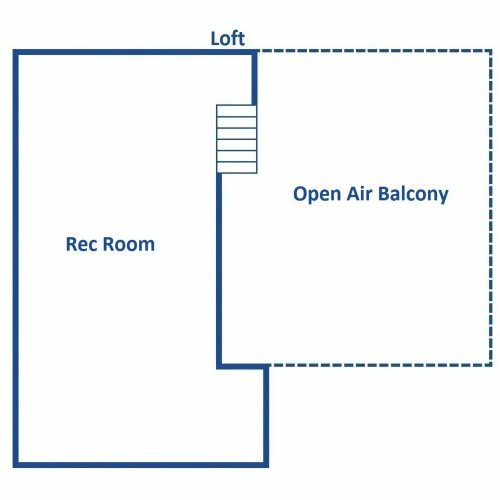 Loft Level - Q over Q Bunk 4 adults or 4 kids. Full Day Bed - Sleeps 1.